Last weekend we got our first look at Shadows Over Innistrad cards on the big stage. 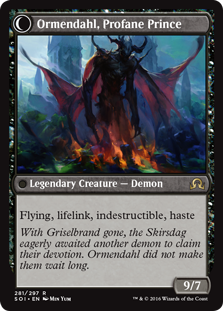 While the results of the tournament unfortunately got mired in some other announcements, which have since been resolved, there was still a bunch of new Standard decks sporting Shadows Over Innistad cards. A few of the decks were know factors coming into the event, but there was plenty of innovation on display among the best performing lists. Here are the Shadows Over Innistad cards that showed up with at least 4 playsets worth among decks with the 22 points or better in the 10 Standard rounds. Despite being ripe for some juicy reprints from the original Innistrad block, we didn't see any in Shadows Over Innistrad - probably because many of the more desirable reprints are insanely good. 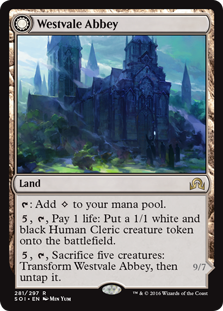 However, a number of new cards played homage to original set, like Invocation of Saint Traft and Thalia's Lieutenant. While Invocation of Saint Traft is pretty inferior to Geist of Saint Traft, Thalia's Lieutenant and Champion of the Parish are certainly closer. Champion of the Parish was often degenerate if played on Turn 1, but it was a terrible topdeck in the late game. Where as while it's slower to come out, Thalia's Lieutenant provides a nice payoff for a board full of humans. Coming into the Pro Tour, the human decks in Shadows Over Innistrad had mostly fallen into two camps. One side was going up the curve for cards like Archangel of Tithes, along with splashing blue for sideboard cards along with Reflector Mage and Dragonlord Ojutai. The other camp, which has mostly won out, is a true white weenie strategy, utilizing around 18 lands and a bunch of 1-drop creatures. 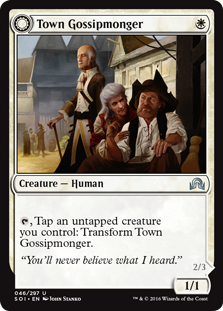 You can do some interesting things with flipping Town Gossipmonger unexpectedly in combat with Always Watching, but it's largely filling space as another 1-drop. Being forced to attack is sometimes a liability, but a 2/3 rumbles past pretty much everything in the opening turns. Westvale Abbey was a card on a lot of folk's radar in the first few weeks. A dedicated deck can flip is pretty easily using either Secure the Wastes or with creatures that come with multiple bodies like Catacomb Sifter. Against some decks a 9/7 indestructible is impossible to deal with and lifelink means racing is almost never an option. In addition, it's virtually free for many decks to splash into their manabase. Even decks that are only going to Ormendahl, Profane Prince on rare occasions are going to appreciate the ability to make a 1/1 for "free" by just weakening their colored mana sources a little. 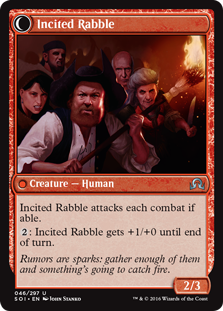 You could make the argument that Town Gossipmonger was arguably chaff that is simply serving reach a critical mass of 1-drops. 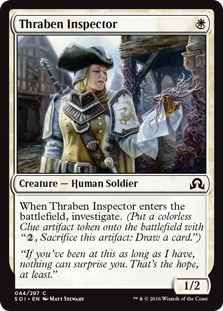 Thraben Inspector on the surface seems pretty unassuming and in the same vein, but this card puts in a lot of work. While something like Town Gossipmonger is sort of propping up a chair leg, Thraben Inspector is the glue that's holding everything together. It's a cheap body for Thalia's Lieutenant and helping to flip Kytheon, Hero of Akros. Getting up to a 2/3 with Always Watching is respectable and dodges sweepers your 2/1s still die too. And white weenie decks are infamous for running out of gas and not being able to close out the game, Thraben Inspector has a clue for helping to solve that problem. Sometimes during spoiler season it's easy to get excited about a powerful card. Flash forward a few weeks and it's seeing virtually zero play because it ultimately doesn't find a home or shell of cards to support it. Prophetic Flamespeaker was basically a 3-legged puppy at the shelter with no one to love it. 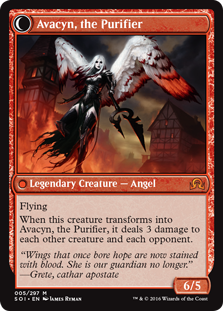 This was simply never going to be the case with Archangel Avacyn. The card continues to be simply absurdly powerful and live up to its pre release hype. 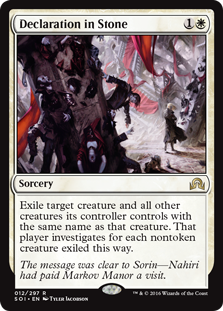 White has proven to be quite the dominate color with the new set, and even a double white spell isn't a huge commitment of white sources being added to your manabase. She also plays both offense and defense well, making her a valuable inclusion for multiple styles of decks. 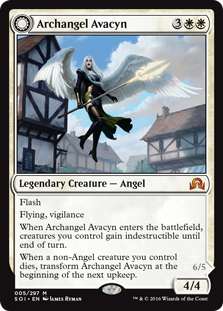 Archangel Avacyn will continue to be a format defining card. There's always one. Some little uncommon that probably got tossed into any number of donation boxes, or just thrown away, before someone realized just how good it was. The big selling point is just how valuable both sides of this werewolf are and how they synergies with each other. The Duskwatch Recruiter side can dig you into more action, and if you're spending time activating it you're probably not casting spells and will transform it. 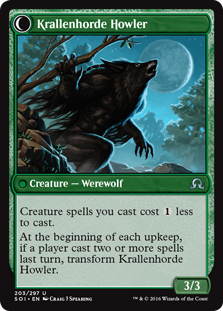 Krallenhorde Howler can then power those creatures out with its cost reduction and you've effectively played a 2 mana 3/3. It plays especially well with Collected Company since you can effectively pass the turn and still develop your board. Another unsung hero that virtually slipped through the spoiler season unnoticed. It's not a flashy mythic, but given time Tireless Tracker will grind your opponent into submission. Granted there's a cost, but effectively all your land drops say "draw a card". Hell, [mtg_cart=Evolving Wilds] is a Divination. 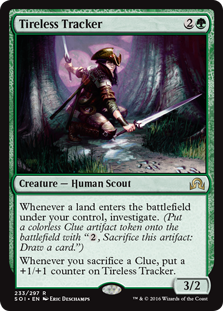 Also important is that while your spending your mana cracking clue tokens, Tireless Tracker means you're still making some impact on the board by growing it bigger. 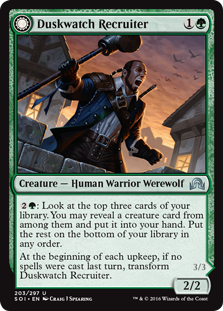 What's interesting is that Tireless Tracker has found a home in Collected Company decks, ramps strategies - they make lots of land drops, and otherwise simply grindy midrange decks. Even with the strict drawback of giving your opponent a card, Declaration in Stone had the strongest showing out of Shadows Over Innistrad. What's important to understand is the context of many of the decks that feature it. They simply make the clue not be a factor in the overall game. A deck full of Savannah Lions isn't going to give you enough time to crack that clue. You're either going to stabilize or probably lose the game with several cards in your hand. Also, some cards a just way stronger than others. Your opponents deck can't be all Ulamog, the Ceaseless Hungers, so chances are they draw a worse resource, and you're still going to be way ahead on mana efficiency. Combine this with a cheap easy casting cost, ability to avoid the graveyard on key creatures, and to simply hose tokens at no drawback, and it's pretty plain to see why Declaration in Stone was the most played card among the best Pro Tour decks.